Blog Quick Quotes: Inky Techniques with Dorlene! Hey there, it's Dorlene and I'm here to show you some cards I made using PowderPuff Chalk Inks. My sister asked me to make some Thank You cards for my nephew's preschool teachers and of course I said, yes. Her only request was to have blueberries in the cards. 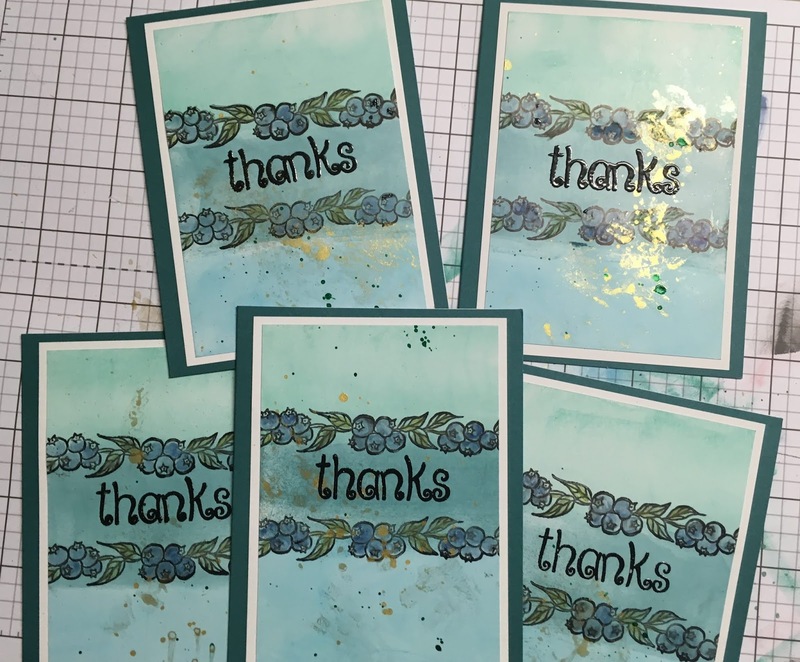 I actually have a blueberry stamp but wasn't sure how to make a card from it. So, I started at the beginning...the background. I gathered Bermuda, Capri Blue and Key Largo PowderPuff Chalk Inks because I thought they would look great with the blue of the berries. I had an idea in my mind to ink stripes on the cardstock so I went for it. I applied each color ink pad directly to the paper in stripes and blended them in where the colors meet using a blending tool for a seamless look. I did this on three different 5x7 pieces of white cardstock and then cut them in half (3.5 x 5) to create six card panels. 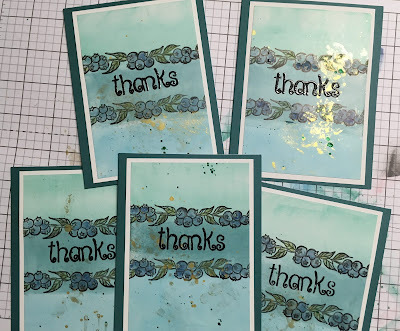 I stamped the blueberries in black archival ink twice on each card panel (where the colors met). I used a water brush and Deep Sea PowderPuff Chalk Ink to color in the berries and Cactus PowderPuff Chalk Ink to color in the leaves. Adhered the panels to a white base before adhering to the colored cardstock card. I really love how they turned out! The PowderPuff Chalk Inked background gave the whole card an interesting but subtle look. Black Embossing Powder by SU!